Happy Friday and HAPPY CHINESE NEW YEAR!!! Have you heard me say before how I say it? The whole phrase, as in "How are you spending Happy Chinese New Year?" or "Should we have noodles on Happy Chinese New Year??" I have not cleaned my whole house. But it wasn't that bad to begin with. I did wash all of my bedding yesterday. We're not supposed to be washing our hair today. I probably will. So I'm doing everything kind of halfway. Does that mean that this year I'll only be half lucky??? The best thing I read on the internet this week. AMAZING. Incredible list of Best Children's Books in 2013. Yes to all of this! Plus the site. All about tea and food pairings? With gorgeous photos? THANK YOU BLOG FAIRIES. Very cool roundup of 'Snow Queen' books. And this book looks amazingly cute! Linked to this before and doing it again -- just SO delightful and a few new pix! Get your photos onto your walls! Cool Book of the Week: So if you recall my post earlier in the week about vintage books I recently found, you'll remember me flipping my lid about 'The Magical Monarch of Mo', which I had been searching for oh, just over 20 years or so. No biggie. Well, 'The Enchanted Island of Yew' is another really obscure L. Frank Baum book that I would love to get my hands on. Let's see, how to explain, apparently some fairy girl decides to spend a year living life as a human.....boy......named Prince MARVEL....(Baum likes this theme, see 'The Marvelous Land of Oz' wherein Princess Ozma spends a part of her childhood in the enchanted form of a little boy, before she is turned back into her real self)...anyway, 'Yew' is meant for slightly older child readers, like 4th-5th grade +, and it's supposed to be a fun fantasy fairy tale. If you're a Baum fan, this one is supposed to be worth seeking out. I am! Have a lovely weekend! I'm probably the only person in the Pacific Northwest who doesn't care about the Superbowl, but we're watching it anyway, with brownies and chili. I'm there just for the brownies. Happy Lunar New Year! I want chai now. Love the blog post about the awesome teacher. Still need more non-Oz Baum books! The rainbow mini cakes look darling. I love the Super Bowl. We're watching it at my sister's, since it's the day after her birthday and that's when she wants to celebrate. Then she and the kids and my dad and whoever doesn't care can play in the basement while we football nuts watch on the big screen. yay, big screen! And I'm making creamy roasted Brussels sprout dip. Hope it's good! Happy Weekend!!! Is tomorrow ok to wash or do you have to wait the 5 days? Question: Can I clean my kitchen? 'Cause it gets dirty after every meal? Wow those posts by Momastery and Rants from Mommyland were brilliant. Fantastic. Thanks for sharing them sweetie. also, it's bumming me out not to vacuum today, should have done it yesterday. i'll just live with it for another day or so. Hi Melissa! 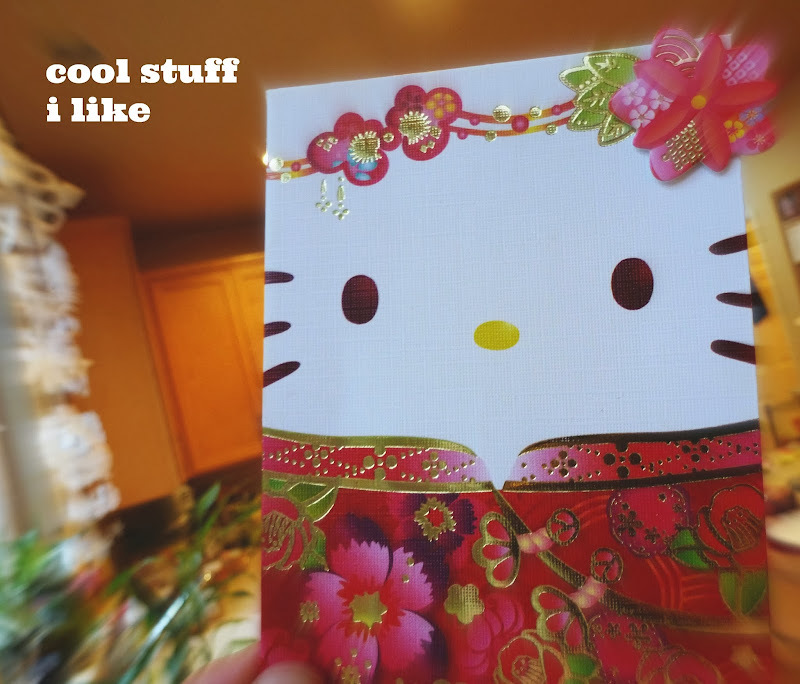 I love the Hello Kitty card! We usually don't cook, dust and vaccuum for 3 days. The 4th day is a major clean up and laundry day! :P I am going to take a shower today and totally washing my hair! I'll never survive camping LOL The Inside Outside book is so beautiful. I would love to get it one day. It's a very nice concept and I'll look for the other books in that collection!